I believe that FERC should deny STT’s application for a Certificate of Public Necessity. And he told FERC to tell Sabal Trail to stop suing his constituents for eminent domain. A year after Rep. Bishop listened in Albany for two hours to complaints about Sabal Trail, Dougherty County and Albany, Georgia filed followup letters to their resolutions against that pipeline. 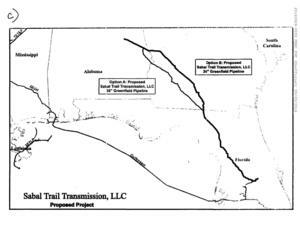 Neither FERC nor Sabal Trail answered them, so their Representative in the U.S. Congress forwarded their letters with that sharp cover letter. Three weeks later, FERC still hasn’t even filed his letter in their e-comment system, much less responded to it. Houston, Houston, do you read? 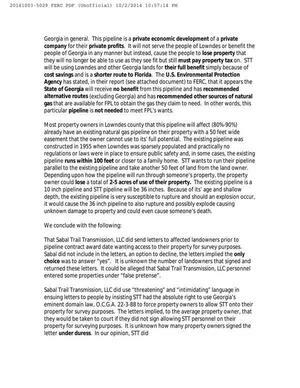 GDOT agrees with Push Back the Pipeline: there’s no Public Convenience and Necessity for the Palmetto Project. Kinder Morgan take your pipeline and go home. While you’re at it, Spectra take your Sabal trail pepeline and go home to Houston. Congratulations to Push Back the Pipeline on this great victory! 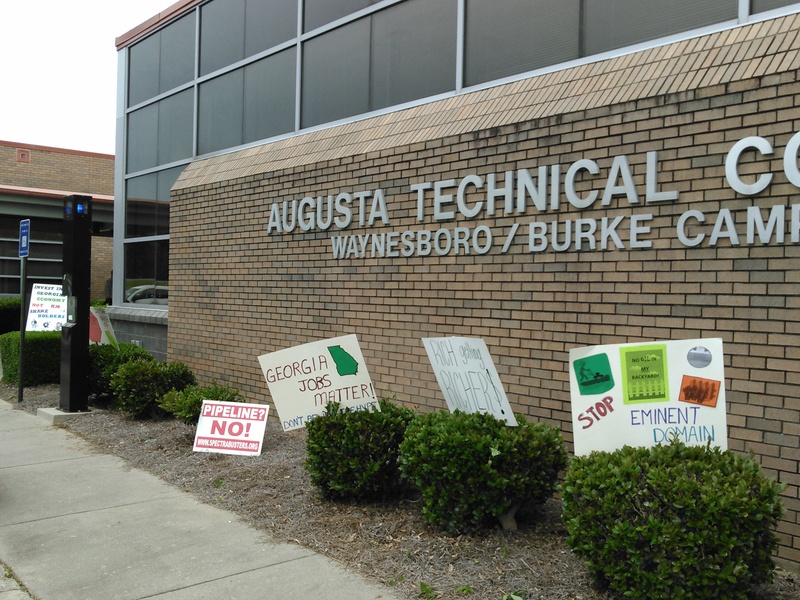 In a blow to Kinder Morgan’s proposed Palmetto Pipeline, GDOT has denied Kinder Morgan’s request for a Certificate of Public Convenience and Necessity. This means the pipeline company cannot declare eminent domain on property owned by landowners who object to this $1 billion pipeline, that would transport gasoline, ethanol, and diesel from Belton, South Carolina to Jacksonville, Florida. Perhaps the same action can be done concerning the Sabal Trail Pipeline proposing to be gouged through Alabama, Georgia and Florida rivers, wetlands, and atop the Floridian Aquifer. It’s integrated into the previous post now. It’s well worth reading. See also Bill and Nanci Kendall quoted in the VDT with protest signs. Update 27 October 2014: Added page 3 FERC had omitted, about lack of need, most property owners already have a pipeline, explosions, false pretense, and duress. Because of the last point about Nathan Deal, several people brought this ecomment to my attention today. 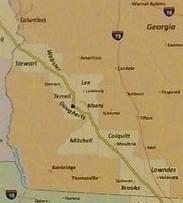 Its main request is for FERC to vacate surveys taken through permission obtained through misleading letters, and make Sabal Trail resurvey only those properties whose landowners give permission after being informed important information such as that Sabal Trail cannot use Georgia eminent domain. Actually, the Lowndes County government got a letter from Sabal Trail 19 June 2013, even earlier than the ones noted below. Also, the point about Delays I haven’t seen before, especially combined with the point about harm to landowners. The date of formation reaches its punchline two pages later in reputation. I added the links and images. Filed with FERC 30 September 2014. 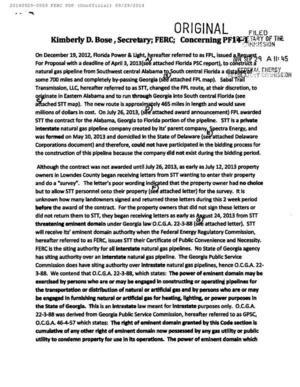 On December 19, 2012, Florida Power & Light, hereafter referred to as FPL. 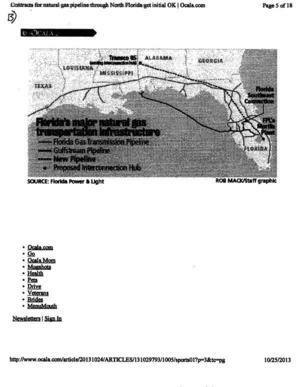 issued a Request For Proposal with a deadline of April 3, 2013 ((A) see attached Florida PSC report), to construct a natural gas pipeline from Southwest central Alabama to South central Florida a distance of some 700 miles and completely by-passing Georgia ((B) see attached FPL map).